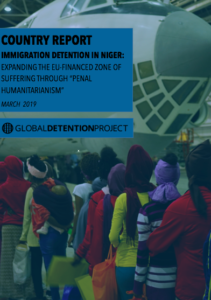 Immigration Detention in Niger (2019 Report): Niger has been a principal migration hub for people criss-crossing the Sahel region of Africa for generations. It has also served as an important transit country for migrants and asylum seekers on the Central Mediterranean route through Libya to Europe. More recently, the country has begun receiving third-country nationals who are “returned,” often forcibly, from Algeria and Libya. Its place on the map has made Niger one of the European Union’s most important targets for extending external migration controls, often under the pretext of protecting migrants and asylum seekers. But there remains very little detailed information concerning the country’s treatment of people while in detention. Observers are also concerned that the EU’s emphasis on financing migration and security programmes in Niger will have long-term negative consequences because they fail to address endemic poverty and under development, and exacerbate existing social problems. View the Niger Immigration Detention Profile Page. Mondays used to be busy days for the passeurs of Agadez as it was the day they often launched their journeys taking clients north across the desert, sometimes with military escorts. At the height of the land crossing from Niger to Libya in the mid-2010s, tens of thousands of refugees, asylum seekers, and migrants traversed these desert routes each month, part of an entrenched economy that supported a wide range of actors, including security agents, smugglers, transport companies, shop owners, and—importantly—migrants. Much of the recent attention on Niger has been on its role in the Central Mediterranean migration route to Europe and its increasing importance to the European Union (EU) and international organisations as a staging ground for migration and asylum schemes. However, the country has been the site of migration flows for generations because of its long porous borders, geographical location, tribal make-up, and close migratory ties to countries across the Sahel region. Niger is one of 15 member states of the Economic Community of West African States (ECOWAS), which provides visa-free travel for nationals of those countries. The principle of freedom of movement within the union effectively means that all nationals from ECOWAS member states are supposed to be able to legally travel as far as the Libyan border. With many West Africans transiting through Niger en route to North Africa and Europe, Niger’s desert town of Agadez has long served as a key transit point. In 2015, the UN Office on Drugs and Crime (UNODC) reported that up to 4,000 people without travel papers were passing through the town each week. Niger’s strategic place on the map has made it a central focus of EU migration “management” strategies in Central and North Africa, helping turn the country into the “the southern border of Europe,” as Caritas quips. A 2017 report stated, “EU engagement in Niger has included a pilot project to convince migrants to stop their journeys, encouraging Niger to pass a law against migrant smuggling, a range of capacity-building projects for law enforcement authorities and the judiciary, and increased cooperation in ‘the fight against smugglers.’” As a result, the passeurs have become outlawed “smugglers,” the delicate political-economies buttressing Niger—locally, regionally, and internationally—have become increasingly destabilised, and migrants and asylum seekers have become increasingly vulnerable to abuses. Also in 2015, the EU launched the Emergency Trust Fund for Africa with the aim of improving “stability and addressing root causes of irregular migration and displaced persons in Africa across three regions of Africa—the Sahel and Lake Chad, the Horn of Africa and North Africa.” Niger has been one of the largest recipients of aid, although much of it has been focused on migration control. By 2016, the country had become the focus of EU-financed migration-related projects whose combined value was nearly 200 million EUR. These included 6 million EUR for the establishment of a joint investigation team to combat irregular migration, human trafficking, and people smuggling; and 30 million EUR to support Niger in its fight against organised crime, smuggling, and human trafficking. Also importantly, despite increasing EU involvement in migration processes in Niger, detailed information related to the treatment of migrants and asylum seekers in the country—including about the conditions of detention—remains very difficult to find. Aside from scattered press and NGO reports identifying police stations that are used to hold arrested migrants and asylum seekers, little effort appears to have been made to systematically track what happens to apprehended migrants in the country. The IOM publishes regular “flow monitoring” reports that collect migration observation data from various locations in Niger as part of its Displacement Tracking Matrix (DTM). However, unlike its DTM page on Libya, which provides a wealth of detention data in “Detention Centre Profiles,” the IOM’s Niger DTM page has no information about where migrants are detained in that country. Further complicating the situation in the country, in recent years Niger has experienced significant “reverse” flows due to emergency humanitarian programmes implemented by international agencies as well as the unscrupulous actions of its northern neighbours. Niger has simultaneously been subject to frequent pushbacks from Algeria and, to a lesser extent, from Libya. These pushbacks, which include both Nigerien citizens and third-country nationals, have revealed important gaps in Niger’s legal framework for assisting these people and in its capacity to host them. In May 2018, the IOM’s Chief of Mission in Niger said that thousands have experienced pushbacks from Algeria, either because they were “stopped by the police in Algeria while attempting to enter the country,” were detected working in Algeria, or were found making their own way back from Libya via Algeria. According to reports, as of mid-2018 as many as 13,000 people—including pregnant women and children—had been “abandoned” in the desert by Algerian authorities unwilling to allow displaced and migrant populations to enter the country. Ultimately, the case of Niger highlights the fraught nature of Europe’s efforts to shift the burden of responding to migration and refugee needs ever further south. In Libya, the involvement of the EU and other international actors in that country’s migration control practices has been complicit in creating a situation in which countless thousands of people have become trapped in nightmarish detention facilities or forced into the hands of ruthless traffickers; in Niger, EU-led efforts to make the country a hub for regional migration management schemes appears to be expanding the zone of suffering. Under pressure and with large injections of money, Niger is adopting measures that threaten the livelihood of many of its citizens, put the well-being of migrants and refugees at risk, undermine the country’s relations with its neighbours, and encourage criminality and corruption. After his October 2018 visit to the country, the UN Special Rapporteur concluded: “Niger has an obligation to protect all migrant persons in its territory, regardless of their status or nationality. Due to its limited capacity, the international community must step up its support to Niger in addressing the root causes of migration and providing regular and safe pathways for migration. This should be done instead of adopting policies that lead to human rights violations and are aimed at banning all migration to the north, turning Niger into a hub for processing forced returns, with complete disregard of international human rights law and raising questions as to the effectiveness and sustainability of these measures in the long term.